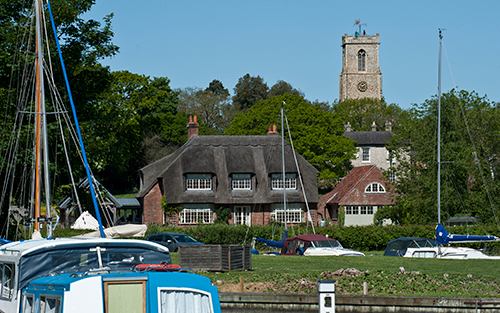 Overlooking Malthouse Broad, Ranworth is a delightful Broads village. Moor at the staithe and enjoy a walk along the board walk to Norfolk Wildlife Trusts floating wildlife centre which has panoramic views across Ranworth Broad. Here you can learn more about the unique wildlife of the Broads and view great crested grebes, cormorants, marsh harriers and the occasional kingfisher. The board walk passes through woodland and reed bed habitats full of interesting plants and woodland birds. During summer keep your eyes peeled for Swallowtail butterflies and Norfolk hawker dragonflies. Ranworth’s other attraction is St Helen’s church, otherwise known as the ‘Cathedral of the Broads’. Climb the 89 steps, two ladders and a trap door to enjoy the panoramic views from the top of church tower. Completed in its present form by about 1450, the church is home to one of the finest rood screens in England. The Ranworth Antiphoner is also on display inside the church and comprises 285 vellum pages of writing and illustrations. Ranworth is popular with boating visitors year round and mooring spaces on the staithe fill up quickly. Boats often mud weight off shore waiting for a mooring to become available. Facilities on the staithe include water, electric hook up and refuse disposal. Free BA moorings are available at Ranworth Staithe. Ranworth Island (tender required mooring charges apply).